Since midterms are now done at school, I've been back to watching documentaries and interviews of jazz musicians. 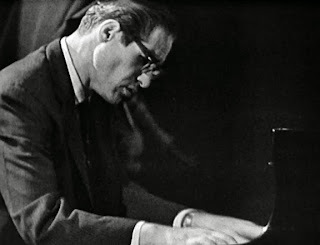 I am particularly interested in interviews with pianist Bill Evans, and I came across a particularly poignant interview where Evans talks about playing simply. I wanted to share some takeaways from this interview that can apply to any field, art, or study. Bill Evans starts the interview by talking about how a jazz musician may go about improvising over a song. Most improvisers will hear the top jazz musicians and their level of mastery, and want to play what they are playing. Yet, Bill Evans warns that this kind of playing without a sense of fundamentals or mastery is only a mere approximation. Rather than be satisfied and say 'I'll work simply with the framework, and honestly, and really, and play something simple'...They try to approximate the other thing, but in a vague way...They're trying to do this thing in a way that is so general they can't possibly build on it. And if they do, they're building on top of confusion and vagueness, and they can't possibly progress. Bill plays several versions of a solo to explain this, then is questioned about the idea of overplaying by his brother who claims that most musicians don't have to time to play simply. This makes Bill Evans explain that your playing reflects what you're satisfied with - mastery or vagueness. What are you satisfied with? In other words, it's better to do something that is real...it can still be satisfactory, but it is something you can build on because you know what you're doing...Whereas if you try to approximate something that is very advanced and you don't know what you're doing, then you can't advance and build on it. The interview goes on to explain the form of jazz songs, with the standard "Star Eyes." Bill Evans showcases the melody, harmony, and rhythm of the song, from simply what's on the page to an individualization of it. When talking about freedom in jazz, Evans states, "There is no freedom without being in reference to something." This line sheds light on what Bill previously stated - working simply with the framework in order to gradually achieve mastery. Bill Evans' lessons are so important for all of us to remember, no matter if you're a musician, artist, teacher, scientist or businessman. So often we get caught up in trying to prove ourselves, that we lose who we are and what is genuine in the process. By breaking things down to their simplest forms, and being completely honest with ourselves, we can master something and enjoy the process. What I've learned lately is that the slow way is the fast way, and that we all have the same amount of natural brilliance and ability of any genius that came before us - we just need to work simply in the process.